The Guardian’s ladder of ten surprises, that wait for a tourist in Prague, completely ignores traditional sights of the metropolis. The list of pearls was put together by the British reporter Sarah Johnson. She recommends solid sights, but also experiences. For example the Zizkov Carnival is at the third place. This list is for those, who are familiar with Prague, they know the traditional sights and want to see the hidden ones. British tourists are the second most numerous group of tourists; a half a million came to Prague in 2007 only. 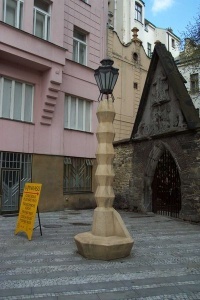 The first place was given to David Cerny, whose artpieces can be seen in the whole Prague. 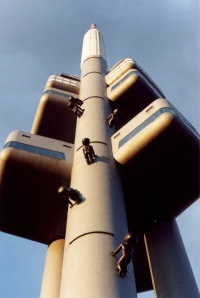 Guardian mentions especially his 3-metres long babies crawling up the Zizkov television tower, or the couple peeing into the Czech Republic at Kampa. Commercial sigts alias shops of young designers close to Karoliny Svetle street were evaluated quite positively as well. Shopping is a part of life, why not enjoy it, wen one becomes tired, it is easy to chill out in atmosphere of surrounding restaurants. The one phenomenal lamp from 1912 that gained the second place is the only cubist lamp in the world, and it is placed behind the Bata department store. The lamp was made famous by Jan Hammer’s video, where the lamp dances and pilots through the metropolis. Among the biggest attractions are Vinohrady district for its gay clubs. The Czech Republic is a liberal country, and so there is sexual tourism. The city part provides both explicit and regular places for gays to hang out. And here is the list – young generation will definitely enjoy there places, rather than sightseeing, that suits for those born earlier.